This website was established while I was a Member of Parliament. The site content is being kept online as a source of information, but all forms and email have been disabled. Updating of the site stopped on 1st January 2010, in accordance with Parliamentary rules. A leaflet, How Your MP Can Help You, is available from the constituency office and can be supplied in bulk with a dispenser. The leaflet is also available online in pdf format. John Barrett holds regular surgeries for constituents – please read our help & advice section for information on who best to contact. 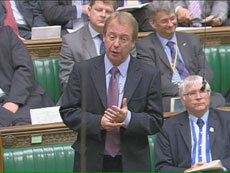 BARRETT’S BLOG: Read John’s blog on the day to day life of an MP. NEWS FEED: This site provides news feed in various formats. QUIZ: Try the website quiz. I hope that you will find it interesting and informative. From 1st January 2010 this feed will no longer be updated, in accordance with Parliamentary rules.